Sri Krishna’s words are nothing but the unsurpassed Truth. And Truth can never be heard too often. So, although the same Truth has been revealed by Sri Krishna again and again, once more, in His great compassion and love for Arjuna and for all humanity, He repeats it in a different way. It is because the Lord is ever watchful over His devotees and loves them so dearly that He never tires of teaching them. 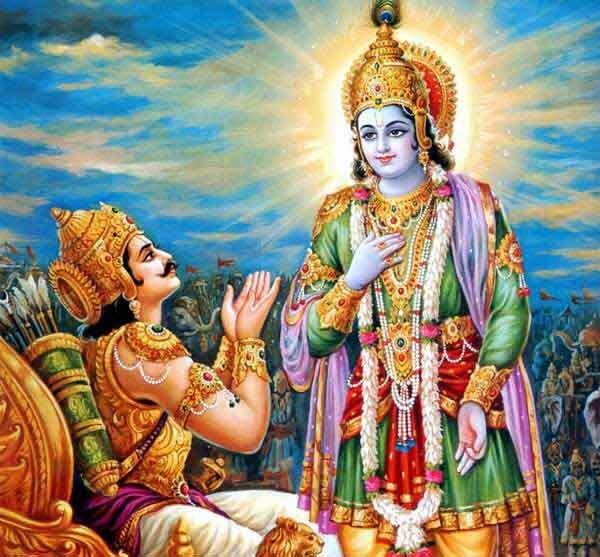 And to Arjuna, especially, the Lord is constantly giving advice because Arjuna received His words with such great joy. It is for that reason, says Sri Krishna, that He is teaching him. No teacher can give the best in Him unless He has disciples to appreciate and understand Him. When the disciples drink in the words of the guru as immortal nectar, then Truth flows from the teacher as from a perennial spring. The real guru possesses all Truth. But the disciples carry away with them only as much as they can comprehend and contain. The holy man is like the fabulous stone called chintamani, which yields anything its possessor thinks of. The guru draws out the best in us. But if we approach him with an indifferent mind full of worldly desires and thoughts, then he will not be able to draw out much spirituality. The mental attitude in which we approach a teacher is so important. There must be humility, a great desire to learn, gratitude and willingness to serve. In India the guru is approached with great reverence and never empty-handed. No matter how humble the little gift may be, something is offered to show one’s attitude willingness to serve the guru. We are all differently benefited by the same teacher. The difference is caused by us, not by the teacher. We receive what we want and what we are ready for. Different persons come to a well to draw water. One has a pitcher, another a can, another a pail. Each one will carry away what his vessel can contain and no more. But the well is filled with water. No one can drain it. So it is with the real teacher. In him is Truth. And Truth is limitless and inexhaustible. All may come and all may receive, and still Truth is there, undiminished. The great teachers are the salt of the earth. They are the bread of life. Again, Arjuna is listening to the same Truth as declared by Sri Krishna. Arjuna never tires of listening to his Friend and Master. Sometimes we get annoyed and irritated having to listen to the same thing so often. We think that we know it by this time. We forget that hearing, we do not hear; for hearing has no worth if it is not accompanied by assimilation. Yes, when we have assimilated the Truth then we need not hear it again. Let us remember that our entire life runs in the opposite direction. We are constantly filling our mind with thoughts contrary to Truth. A constant stream of illusory suggestions runs against our brain. We are told every moment of our existence to accept as reality that which is only a passing dream. We hear, see, touch and imagine untruth or relative truth all the time. It requires therefore a strong current in the opposite direction to counteract these false impressions. It is therefore so necessary to listen to what is true at every opportunity that presents itself and to cherish and keep alive whatever of Truth we receive. It is the Lord Himself who teaches, for who is there who has realized the Spirit? Who can teach? Only he who knows. And very few know. Therefore Sri Krishna Himself teaches us.